Every iPhone, iPad, and iPod touch comes pre-loaded with a ton of useful apps from Apple, but sometimes those apps can go missing. If that happens, you may wonder where they went, why they disappeared, and how to get them back. The apps that this can happen to include the App Store app, the Safari web browser, the iTunes Store app, Camera, FaceTime, and many others. There are a number of possible reasons why an app has disappeared. It could have been moved or deleted. That's obvious. Less obvious is that "missing" apps may still be on your device, but have been hidden using the iOS's Restrictions feature. This article explains each reason for why an app could be missing from your iPhone or other device and how to get your apps back. The Restrictions feature built into the iOS allows users to turn off certain pre-installed apps and features. 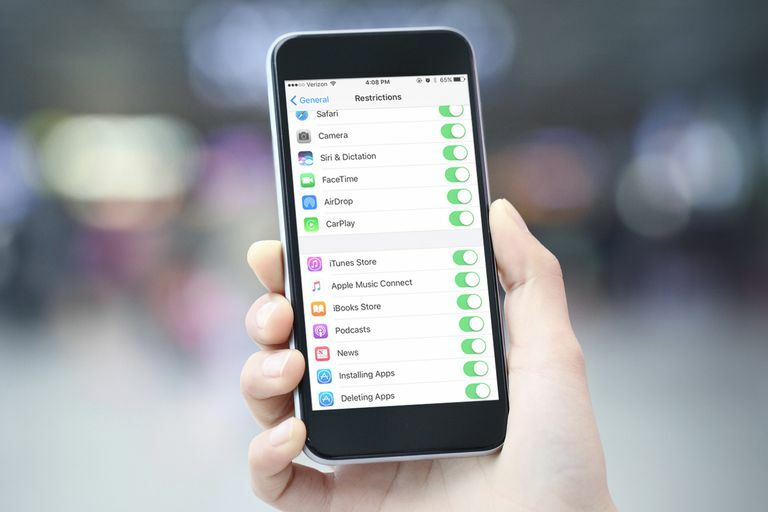 Besides blocking apps, Restrictions can be used to disable or block changes to a lot of functions and features of the iOS — including Privacy settings, changing email accounts, Location Services, Game Center, and more. As mentioned earlier, there are two groups of people who will generally use Restrictions to hide apps: parents and IT administrators. Parents use Restrictions to prevent their children from accessing apps, settings, or content that they don't want them to. This can be to prevent them from accessing mature content or from exposing themselves to online predators via social networking or photo sharing. On the other hand, if you get your iOS device through your employer, apps may be missing thanks to settings instituted by your company's IT administrators. They may be in place due to corporate policies about the kind of content you can access on your device or for security reasons. If your App Store, Safari, or other pre-installed apps are missing, it's possible to get them back, but it may not be easy. First, make sure that the apps are truly missing, and not simply moved to another screen or in a folder. Not all apps that appear to be missing are actually hidden or gone. They might just be moved. After upgrades to the iOS, apps are sometimes moved to new folders. If you recently upgraded your operating system, try searching for the app you're looking for using the built-in Spotlight search tool. If Spotlight doesn't turn up the app you're looking for, check to see if Restrictions are enabled in the Settings app. How you turn them off depends on what version of the iOS you're running. If Restrictions are already turned on, you'll be asked to enter the passcode. This is where it gets hard. If you're a kid or a corporate employee, you may not know the passcode your parents or IT administrators used (which is the point, of course). If you don't know it, you're basically out of luck. Sorry. If you do know it, though, enter it. If you can access the Restrictions settings, you can enable some apps while leaving others hidden, by moving the slider next to the app you want to use to on/green. Move the Content & Privacy Restrictions slider to off/white to enable all apps and turn Restrictions off entirely. The same issue with the Restrictions passcode as described in the last section applies here. If you know the passcode, enter it and choose which apps to enable. Tap Disable Restrictions to enable all apps and turn Restrictions off entirely. Your apps could also be missing because they've been deleted. As of iOS 10, Apple allows you to delete some pre-installed apps (though technically those apps are just hidden, not deleted). Earlier versions of the iOS didn't allow this. You get these deleted apps back by reinstalling them. To learn how to reinstall built-in apps that have been deleted, read How to Download Apps You've Already Purchased. If you've jailbroken your phone, it's possible that you have truly deleted some of your phone's built-in apps. If that's the case, you'll need to restore your phone to factory settings in order to get those apps back. This removes the jailbreak, but it's the only way to get those apps back.